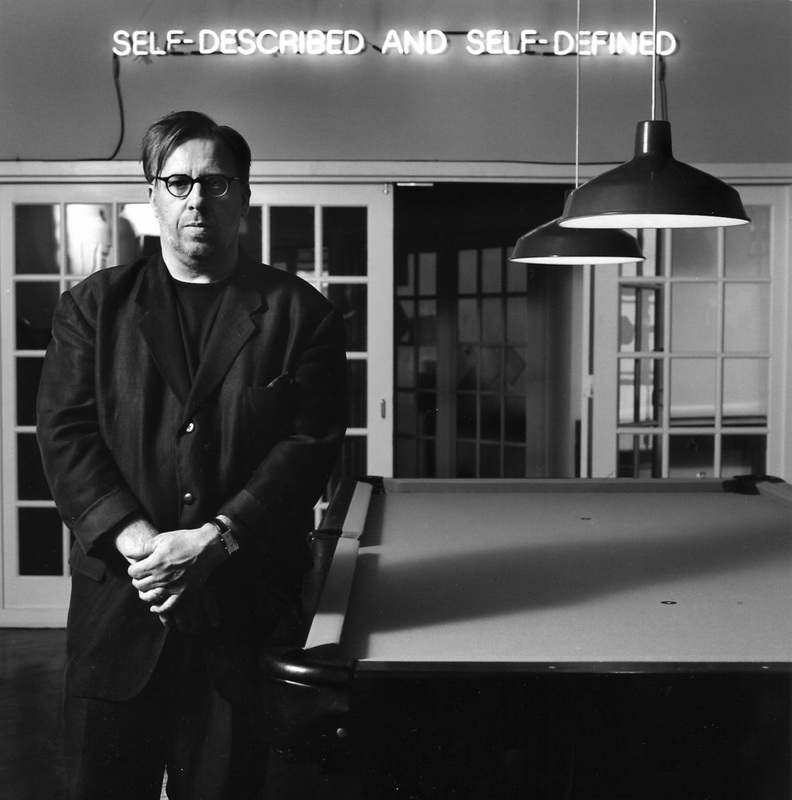 Joseph Kosuth is an American Conceptual artist whose work focuses on exploring the nature of art and creating artwork that is about the meaning, not necessarily on producing work that we typically view as fine art. Kosuth, who draws from both his studies in anthropology and philosophy, is one of the pioneers of the conceptual art movement that came about in the 1960’s. Conceptual art was defined based on the grounds established by the artists themselves and was conceived of entirely by the artists. The art of Kosuth was idea driven. He rejected the idea that art should be based on aesthetics, and states that in the past, art’s function was its value as decoration. He believes that art’s only claim is for art; that art is the definition of art. “Art as Idea as Idea” is a series of work by Joseph Kosuth that involves texts through which he probed the condition of art. He went about the series by using the idea that art is a set of formal problems. He had a shift in what he thought and understood was the context of his work. The creative process to him was in changing the idea of art itself. Without larger meaning, art was reduced to decorative, formalist works. His most renowned work in this series is “One and Three Chairs.” The 1965 work consists of a chair, an image mounted on the wall of the chair in actual size, and a print of the dictionary definition of the word “chair.” It also comes with instruction for the realization of the piece. In each location the work is set up, it will be different aesthetically yet it will keep the same idea. The goal of “One and Three Chairs” is to show that a work of art can embody an idea that doesn’t change, despite constant changes to its elements. It can be set up anyhow, by any one, with any chair, yet keep the same core idea that Kosuth intends behind the work. “One and Three Chairs” looks at the relationship of language and a narrative in works of art. It attempts to solve the problems associated with art by making the artwork interchangeable, and substitutable. Because you can essentially create the artwork anywhere once you follow the instructions, the work can be created anywhere by anyone. It was the idea of the work that constituted the work, rather than the formal artistic elements. It is very interesting that Kosuth values the idea behind the piece more so than simply what you saw. To him, the most important thing in his piece is the idea. Every work of art to Kosuth is tautological, and it describes only itself. 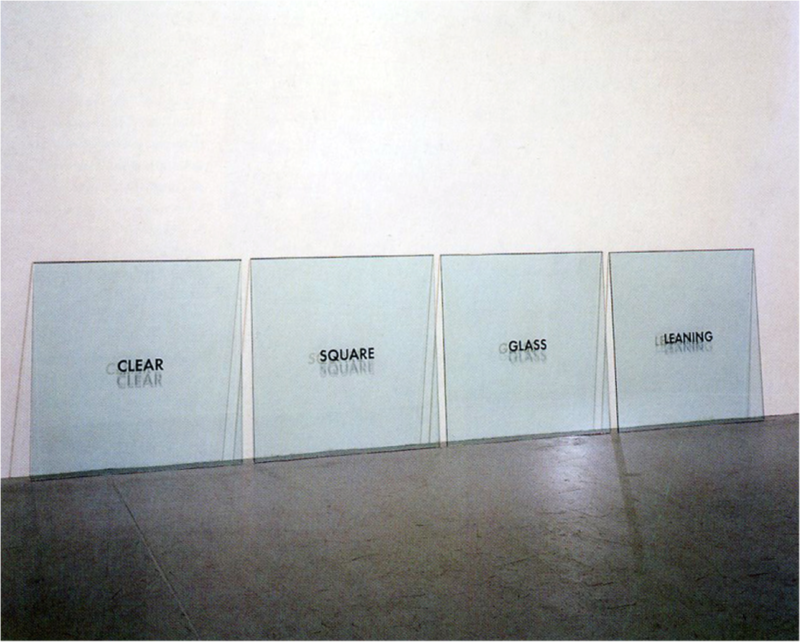 In one of his works (Leaning Glass, 1965), he has 4 square panels of glass leaning against a wall. Each glass has a different word that is factual and descriptive of the glass pane. The words are “glass,” “square,” “leaning” and “clear.” His work makes the viewer consider what is art, and he uses his philosophical learnings in order to define what art is. Kosuth says that he chose glass as the medium due to the fact that it was clear, and there were no compositional problems as far as choice or location or color. He first started the process of the work by figuring out the presentation of the glass. He tried smashing it, stacking it, but this led him to try using language in the work. With his first glass piece he leaned it against the wall, with a lable next to it reading “Any Five Foot Sheet of Glass to Lean Against any Wall.” The work was neither a sculpture on the floor nor a painting hung on the wall, and as glass had no form or composition. His neon signs also explore the tautology in art. He creates neon signs of text that state exactly what it is. 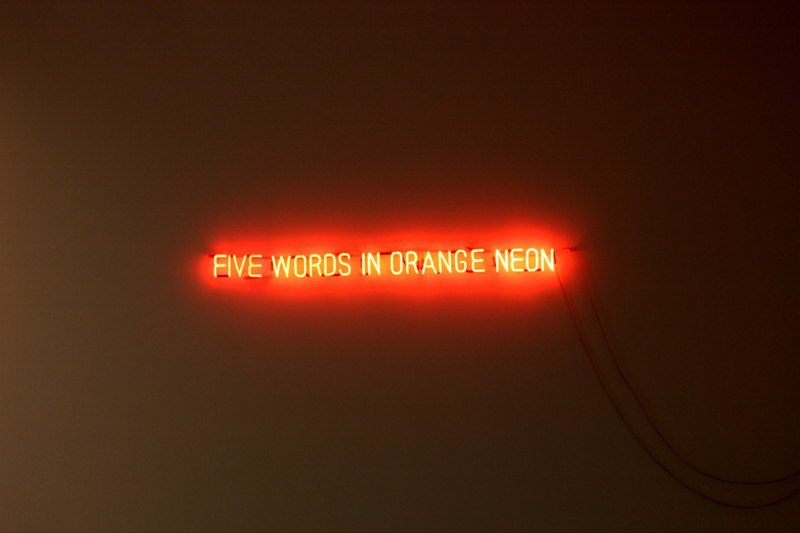 “Five words in orange neon” is a work of Kosuth’s done in orange neon. It is exactly what is written, five words in orange neon. 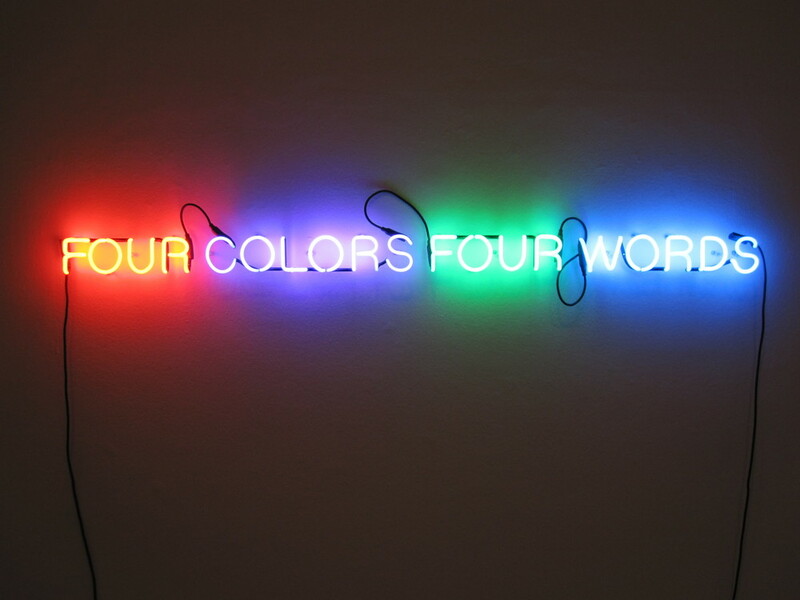 Or similarly, "four colors four words." It looks at the semiotics in the art and how the word relates the way it is portrayed. Joseph Kosuth focuses on the meaning of the art, and not simply the fashioning of forms and colors. The making of meaning is what he believes art to be. He states that artwork must involve a test and that art that doesn’t work within this context consists of illustrations of what art might be. Joseph Kosuth is a very important figure in the last 50 years and he has helped to better define art. His work is similar to Duchamp in that if someone says it is art, then it’s art. One of his inspirations is Ad Reinhardt who painted black squares. He believes that what made Reinhardt an artist is not the fact that he paints black squares, it’s the meaning behind what he is doing, and this is just what Kosuth wants in his work, for the meaning to be the important thing and to come through.